This week we worked on transition words and sequencing. To introduce transition words, I like to use How To stories. First, we read several stories about snowmen. Then, we brainstormed things we would need to build a snowman. Like that LOOOONG arm? Don't you just love First Grade art?? Next, We created a Transition Word Tree Map. 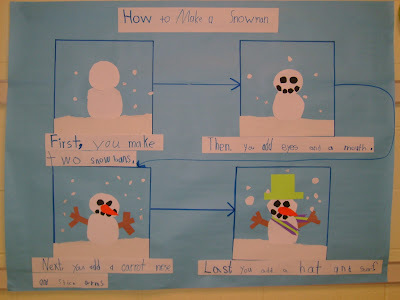 After that, we completed a How to Make a Snowman Flow Map. 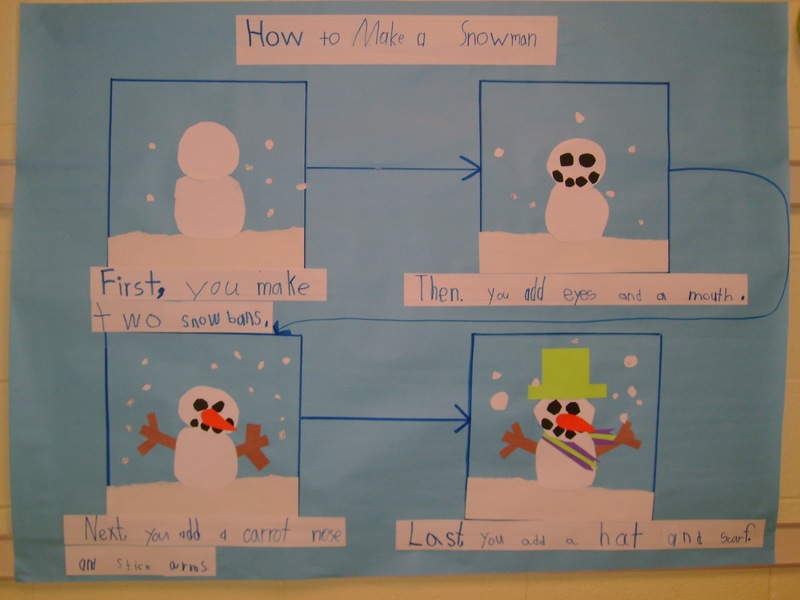 This was inspired by Deanna Jump's Snowman Unit. The snowman pattern is hers. Later, we broke into groups and chose a How To topic. Finally, we created How To charts. and then wrote sentences to match their artwork. artists were able to make big contributions! and these kiddos know their teacher loves borders! HA! Close up-"Then you make two black lines and two red circles for the antennae." Somehow one group was left off...and need to post more close ups! We presented our charts to our classmates and our sweet Kindergarten classes! They were super proud of their final products! I am super proud of them! Funky First Grade Fun has a great giveaway with a little help from her friends! The girls at Made in the Shade in Second Grade are giving away two $25 gift cards! Mrs. Bainbridge is giving away a very cool cup! Swinging Through Second is giving away a $10 gift certificate to TPT! Sheree at Peterson's Pad is having a 100 Follower giveaway!